Ben Mezrich's bestseller Bringing Down The House: The Inside Story Of Six M.I.T. Students Who Took Vegas For Millions focuses on "Kevin Lewis," the leader of a team of gifted math students who developed a system for beating the house in blackjack. Using card-counting techniques and an intricate language of hand and verbal signals, they seized upon tables while they were "hot" and tipped the odds in their favor; by pooling their money, they lessened the variance inherent in games of chance. Eventually, casinos caught on to their methods—which are entirely legal, it should be said—and kicked them out, but not before they stole away with around $4 million in winnings. Mezrich's book is non-fiction, and perhaps the students' scheme plays out convincingly on the page, but it definitely didn't go down like it does in the laughable film adaptation 21. Not even the sleepiest surveillance man in Vegas could miss the gang's conspicuous hand gestures or sub-Alias disguises, which grow so absurd by the end that the hero played by Jim Sturgess, a bland Tobey Maguire type, is made to look like Andy Kaufman alter ego Tony Clifton. And he isn't even the most ridiculous-looking guy at the table: That honor goes to a teammate donning a 10-gallon hat and glued-on sideburns, looking every bit the free-spending Texas oilman from last year's Halloween party. In the broadest possible fashion, 21 establishes Sturgess as a shy, upstanding young nerd with impeccable academic credentials (a 4.0 GPA at M.I.T., stratospheric SAT and MCAT scores) and humble middle-class Boston roots. 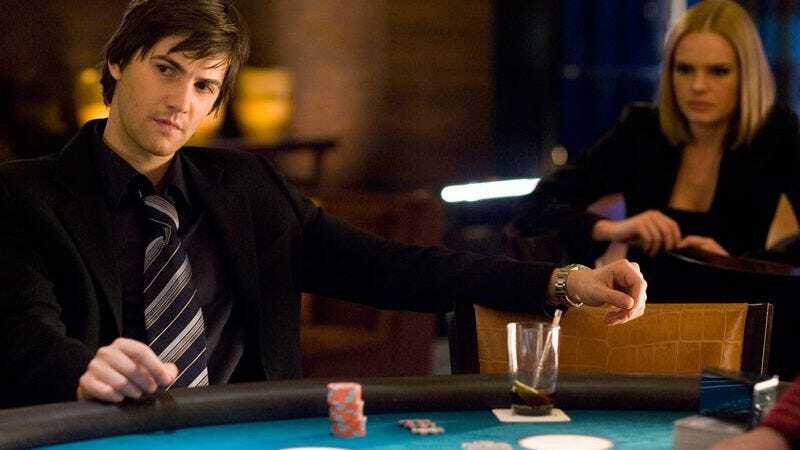 Lacking the $300,000 he needs for Harvard Medical School, Sturgess gives into wicked temptation when he's roped into an underground blackjack team headed by one of his professors, played by Kevin Spacey. He and his new friends, including love interest Kate Bosworth, fly to Vegas on the weekends, but his lucrative double life eventually takes a toll on his once-clear conscience. Meanwhile, a veteran Vegas surveillance man (Laurence Fishburne) threatens to shut down their operation the old-fashioned way. Before sinking into a predictable morality tale, 21 coasts on the superficial thrill of watching casinos take a few hits, but gamblers looking for a how-to lesson on winning in Vegas will be putting their pencils down pretty quickly. It makes no sense for this same group of six people to congregate so closely at the tables, and even less sense that they'd keep appearing to Fishburne on the monitors, since his services are useful only to the few casinos that don't have more advanced, computerized card-counting profilers. As it heads into the second hour, 21 loses its buzz and slip into a predictable series of life lessons, double crosses, and the group's ever-more-desperate (and unintentionally hilarious) efforts to be incognito. Short of counting the cards out loud, these geniuses seem to do everything they can to get caught.